More than a dozen demonstrators gathered at a Verizon Wireless storefront on Market Street today as part of a national day of action protesting executive raises as worker health care costs go up and wages are cut. The Communications Workers of America, which represents Verizon Communications workers, is currently in contract negotiations with Verizon Communications, a wing of the company that is separate from their wireless operation, and is demanding that Verizon continue to pay the full cost of their health care premiums, instead of giving executives raises. “The only way to really achieve this goal is at the bargaining table,” said Ray McConville, manager of media relations for Verizon Corporate. The rally won’t impact the year-long negotiations, he said. Demonstrators handed out informational leaflets highlighting the corporation’s recent profits, as well as a combined net salary of more than $349 million shared by five executives in 2011. “We will never have economic recovery as long as companies like Verizon take disposable income out of the middle class,” said Libby Sayer, CWA district nine media representative. Management at the Verizon store at 768 Market Street in San Francisco said they were unaware of the national day of action. 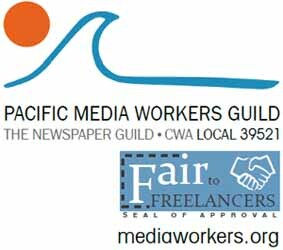 Fog City Journal is associated with the Pacific Media Workers Guild, a local of the CWA. Originally from San Diego, Sara Bloomberg is currently studying journalism at City College of San Francisco and has a background in Politics and Language Studies from the University of California at Santa Cruz. Her other interests include photography, bicycling and cooking up a storm in the kitchen. She is an editor and reporter for The Guardsman, the City College newspaper, and is particularly interested in investigative and enterprise journalism — and happily dabbles in photojournalism, too. Comments for Workers say, ‘Verizon is Verigreedy’ are now closed. Interesting that this protest is representing workers on THE EAST COAST not anywhere in San Francisco for Verizon Communications not Verizon Wireless. Verizon Communications has no business out here (such as Dsl, cable or Fios!) & you can thank older landline laws & even At&T partially for that. It seems though the CWA does have workers, though AGAIN there is no service out here, so they are protesting for someone else?? Looks like the CWA has time on their hands.